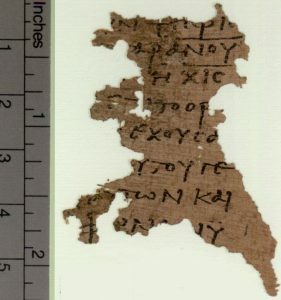 This is the Papyrus Oxyrhynchus (or P.Oxy. ), the oldest fragment of this part of Revelations that we have. On the third line you can see the letters “XIC” which is the ancient Greek shorthand for 616. Such, then, being the state of the case, and this number being found in all the most approved and ancient copies [of the Apocalypse], and those men who saw John face to face bearing their testimony [to it]; while reason also leads us to conclude that the number of the name of the beast, [if reckoned] according to the Greek mode of calculation by the [value of] the letters contained in it, will amount to six hundred and sixty and six; that is, the number of tens shall be equal to that of the hundreds, and the number of hundreds equal to that of the units (for that number which [expresses] the digit six being adhered to throughout, indicates the recapitulations of that apostasy, taken in its full extent, which occurred at the beginning, during the intermediate periods, and which shall take place at the end), — I do not know how it is that some have erred following the ordinary mode of speech, and have vitiated the middle number in the name, deducting the amount of fifty from it, so that instead of six decades they will have it that there is but one. What John’s grand-disciple was talking about here is the Hebrew practice of Gematria where a number is associated with each alphabet, enabling words to be converted into representative numbers. This practice was also applied to transliterated Greek (and Latin) words and that was, according to Irenaeus, what John was doing in the Apocalyse (Revelations.) So how does that work? *I should mention that the Hebrew word for Caesar is usually spelled with a “yud” or קיסר and the one used in the example above is a variant but a valid one. Jastrow’s dictionary of the Talmud (1926 ed., pg.1365), for example, lists both forms of spelling. Likewise, Nero is sometimes spelled with a trailing “nun” (n) as in “Neron” or without it. In many cases, the regular “nun” is used (=50) rather than the trailing/final “nun” form as written above (=700). 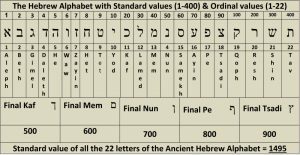 In the Gematria, the alphabets are numbered as “aleph” = 1, “bet” = 2, “gimel” = 3 and so on until 10, and then increases by tens until you reach a hundred, and then by the hundreds until you reach the last alphabet “tsadi” = 900. 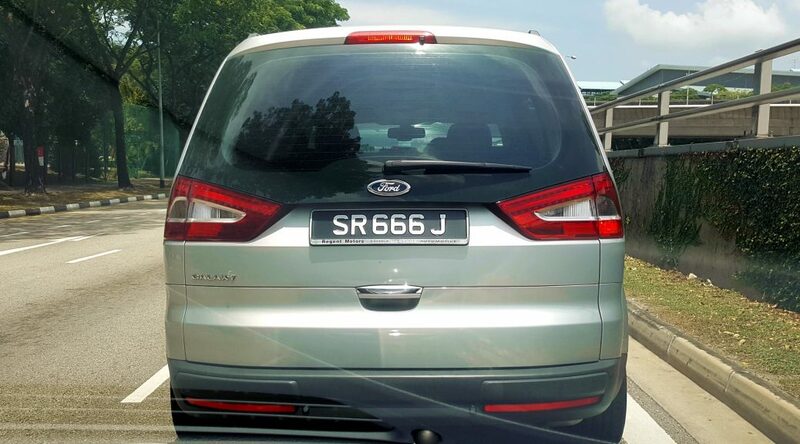 For the title נרון קסר you end up with the number 666. However, if you drop the trailing “n” and use “Nero” (typical of Latin) instead of “Neron”, your number adds up to 616. It is this peculiarity that suggests that the person behind the number is Nero. The earliest readers must have known this and altered the number to match their alternative spelling of his name, and thereby generating the alternative number 616 as found in some of the earliest extant manuscripts. So, we identified the “beast”, it seems. Unfortunately, life is never that easy, is it? Given that most scholars believe that the book of Revelations (also known as the Apocalypse of John) was written circa 90AD or later, it seems a little odd for John to refer to Nero who reigned between 54-68AD as the “beast”. The mystery remains!